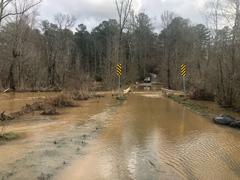 Clayton County Emergency Management and the Transportation and Development Department is monitoring and assessing the infrastructure of the culvert and roadway at Turner Road following heavy rainfall, resulting in flooding and temporary closure of Turner Road where it crosses Hurricane Creek. Traffic control measures (barriers/signage) are in place to guide motorists away from the bridge. Motorists are urged to use caution and to avoid the area because safety is priority. The road closure is south on Turner Road. Residents may enter from McDonough Road or New Hope Road depending on the location of their residence.